Ethics and Religion: March 18, 2015: Column 1751: Why Are Southern Baptists Shrinking? Why Are Southern Baptists Shrinking? The front page of the magazine SBCLife, of the Southern Baptist Convention, which goes to 54,000 pastors and church leaders, reported that America’s largest Protestant denomination has shrunk every year from 2007-8 with 16,228,000 members to only 15,736,000 in 2012-3. That’s a loss of nearly a half million members (492,800) – more than many entire denominations such as the Christian and Missionary Alliance, the Presbyterian Church in America and the Russian Orthodox Church. In addition, SBCLife reported that per capita giving has fallen from $747 to $712, a drop of 4.5% even though the economy rebounded in that time. Giving to Southern Baptist Churches for all causes declined by a stunning $911 million, a drop of 7.2%. There was one hopeful sign. In the first four months of the fiscal 2014-2015 year, giving to the SBC Cooperative Program increased for the first time since 2012. Two special seasonal missions offerings, the Lottie Moon Christmas Offering for International Missions and the Annie Armstrong Easter Offering reported signs of rebound. 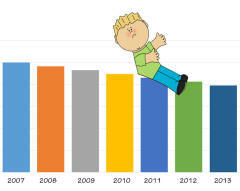 After plummeting from $150 million in 2007 to $141 million in 2008, giving bounced back to $154 million in 2013 – beyond its high point six years earlier. However, the church has more bad news. Its baptisms fell to 310,000, the lowest number since 1946! As recently as 1980 there were 429,000 baptisms and 419,000 in 1999. Baptisms are of fundamental importance to a denomination called the Southern Baptist Convention. I admire SBCLife’s courage in posting grim numbers in a lead article with eye-popping graphs, showing annual declines of people and giving. Indeed, the International Mission Board, working with local Christian leaders reported helping start nearly 6,200 new churches in many countries and more than 114,000 baptisms. The North American Mission Board, with 2,600 missionaries, planted 936 new churches in the U.S. in 2013. However, more SBC churches closed in America than new ones were opened. Oldham also reports the churches which closed had more members than the startups. The churches which are closing were started by the “Builder Generation,” born before 1946 and by the “Baby Boomers,” from 1946-64. They are now moving near their adult children and grandchildren, to nursing homes or dying. Neither he nor Oldham could suggest how to turn things around. I’m not a Baptist, but I have an analysis leading to a fresh suggestion. In 1971, 69% of American households were headed by a married couple, according to Census, but only 48% in 2014. This is a much steeper decline than experienced by Southern Baptists, but it explains what’s behind their decline – and that of most other denominations. In 1970 when there were 203 million Americans, 2,159,000 couples got married, for a marriage rate of 10.6 per 1,000 people. But in 2012 there were only 2.2 million marriages for 314 million people, for a marriage rate of 6.8. In other words, there were no additional marriages, though population grew 111 million. What’s soared is cohabitation, up 15-fold from 523,000 in 1970 to 7.9 million last year. Cohabiting couples are not church-goers. Nor do they marry. Only 1.25 million married last year. What happened to the other 6.65 million? Most broke up. Pastors: here’s a clear message to preach: DO NOT COHABIT, and face an 84% breakup rate before there is a wedding – and a higher divorce rate. “Flee fornication,” said Paul in I Cor. 6:18. Remain chaste until you marry. Evangelization is a marriage issue.